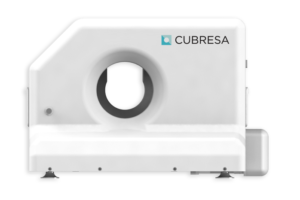 Cubresa to exhibit innovative Spark preclinical SPECT scanner at SNMMI | Cubresa Inc.
Cubresa today announced it will debut its novel Spark preclinical SPECT scanner at the Society of Nuclear Medicine and Molecular Imaging (SNMMI) Annual Meeting, June 8 – June 10th in St. Louis, Missouri. Attendees are invited to visit booth #503 in the exhibition hall to learn more about the product. The Spark SPECT scanner for in vivo imaging breaks convention by optimizing performance for imaging mice. Its slim bore positions low-profile solid state detectors close to the animal subject, maximizing sensitivity and resolution, and minimizing space, resulting in a smaller, lighter scanner which doesn’t compromise performance. The Spark enables preclinical researchers to accelerate acquisitions by delivering impressive sensitivity using collimators with numerous, densely packed pinholes and up to 4 detector heads per system. The 4-detector configuration will eliminate gantry rotation altogether, resulting in lightning fast acquisitions ideal for imaging dynamic processes. Sub-millimeter spatial resolutions and the Spark’s ability to integrate with microCT scanners allow researchers to evaluate tracer uptake in small targets with anatomical context. James Schellenberg, CEO of Cubresa said: “With the Spark, we are redefining what a preclinical scanner should look like by focusing on smaller, simpler to operate products which still offer excellent performance. This year’s SNMMI is the first scientific symposium in which Cubresa exhibits our products, and we are very excited at this opportunity to connect with our customers”. Visit www.cubresa.com/products for more information on the Spark compact SPECT scanner.